This is one of those super-easy recipes that uses convenience ingredients from the supermarket. I saw it on Trisha Yearwood's cooking show on Food Network...here's a link to the original recipe. It's pretty darned tasty! I reduce the amount of cinnamon sugar sprinkled on the crust, and I skip the cinnamon whipped cream altogether...this pie doesn't need it. Melt butter in 9" or 10" cast iron skillet over medium heat. Reserve 1 Tablespoon of melted butter for brushing on top crust. When the butter is melted, add brown sugar and stir until melted and bubbly, 2-3 minutes over medium heat. 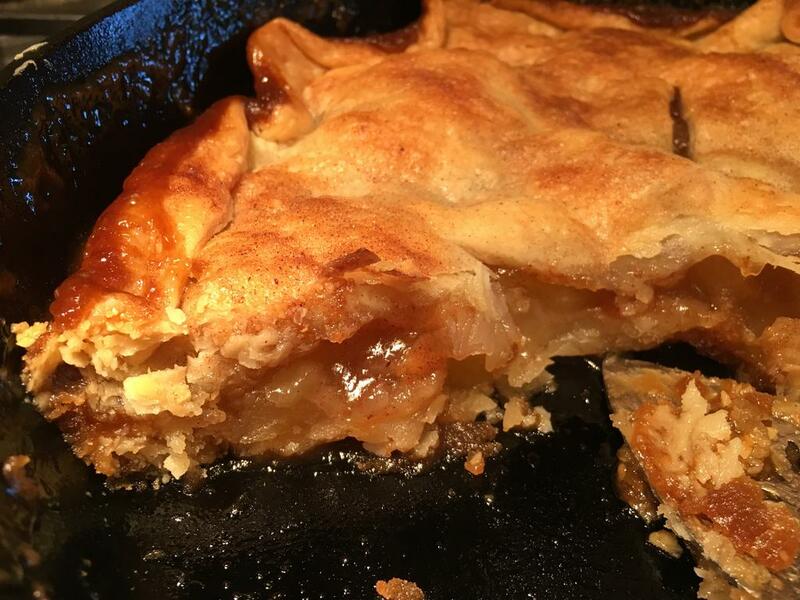 When melted, remove from heat and place one pie crust over the butter/sugar mixture, lining the skillet. 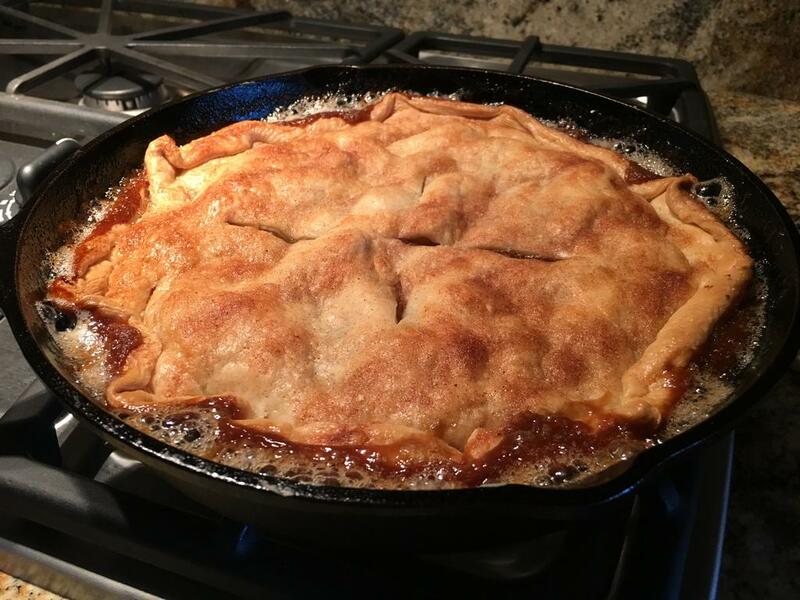 Pour apple pie filling over crust and spread out evenly. Sprinkle 1 Tablespoon cinnamon sugar over the apple filling. Cover the filling with the remaining pie crust, roughly folding over the edges around the pan. There are no style points here, just fold and tuck the top crust as needed so it's inside the edge of the skillet. Brush the top crust with the reserved melted butter, then sprinkle with the remaining cinnamon sugar to your liking...I use some but not all of it, maybe 1-1/2 teaspoons. Cut four vent slits around the center of the crust. Bake for 30 minutes. Check for over-browning of the crust about 5 minutes before end of baking and remove if starting to over-bake. Serve warm. If you want to gild the lily, serve with regular whipped cream, the cinnamon whipped cream from the original recipe, or vanilla ice cream. Yum! I baked this pie tonight for desert. Easy Peasy. Thanks for the post! Terrific looking pie Chris. Thanks for the recipes. Weber OTG 26.3/4" Kettle, Weber Silver 22 1/2 " Kettle (2), Blue Performer, Jumbo Joe, Smokey Joe (49er Edition), WSM 22 1/2 ", WSM 18 1/2, WSM 14 1/2"